Summary: I love it, unreservedly; as far as I'm concerned, its a masterpiece. Has it really been twenty years? Blimey. I guess it has. The 20th Anniversary edition of Withnail & I arrives, plop, on my doormat and it’s a thing of beauty, a metal box like a old school pencil case (anyone born in the sixties will know what I mean) and a few packets of branded Rizlas in case I fancy making my very own Camberwell carrot. I remember seeing Withnail for the first time in the Phoenix Cinema in Jericho, Oxford. I was the ‘film rep’ for Brasenose, a sinecure which basically meant I could go and see films in the afternoon for free (a lifelong ambition which I have pursued wholeheartedly ever since). I sat in the cinema with three other people and I so desperately wanted to howl with laughter but was embarrassed at the thought of my chortles echoing round the empty auditorium. So I laughed *on the inside*. I’ve been quoting W&I ever since; though I try not to do it in an annoying obsessive way, there are so many fantastic lines that I can’t resist repeating a few here. ‘We want the finest wines known to humanity’. ‘As a boy I used to weep in butchers’ shops’. ‘We’ve come on holiday by mistake’. 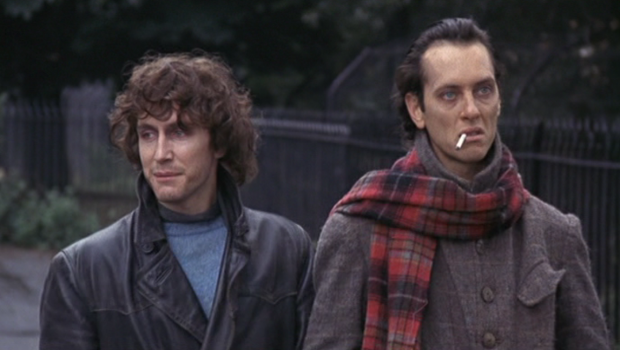 I apologise to anyone who doesn’t know anything about Withnail and I. Here’s a quick plot summary: two out of work (and not very good) actors, aristocratic Withnail (Grant) and I (McGann), share a crumbling flat in Camden, where they appear to survive on lighter fuel and the occasional saveloy. Freezing and skint, they tap Withnail’s wealthy Uncle Monty (Griffiths) for the keys to his Cumbrian cottage and head for some fresh air. A few country mouse/town mouse misunderstandings involving chickens, eels and bulls later, they are just starting to enjoy themselves when Monty turns up, his eye having been caught by I’s beauty (the young McGann is like a Caravaggio). They flee back to London, and, well, that’s about all. Oh, I’m sorry! But the dialogue, the dialogue. Every aspiring screenwriter should watch this film. I love it, unreservedly; as far as I’m concerned, its a masterpiece. The DVD extras are a mixed bag; there’s a rather tiresome film that is little better than a fan flick featuring two obsessives wandering round Penrith, but everything else is worth a watch; interviews with Bruce Robinson, an older I, talking about all the teething problems, and Grant and McGann, fifteen years older, discussing the film that launched both their careers.